TNDV’s relaunched Destination mobile unit has a lengthy history. 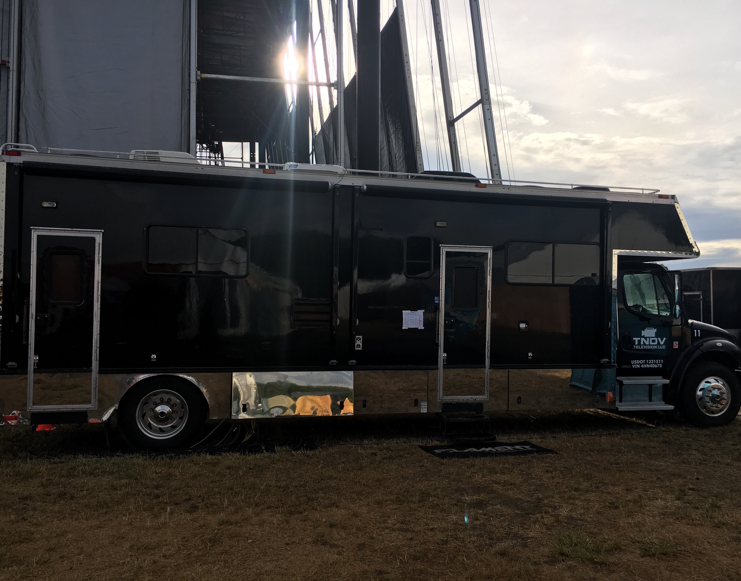 The Tennessee-based mobile-production-services provider is actually the third owner of the truck, which was known as Blackjack when TNDV took ownership and was often used for sports production by its previous owner, Greystone Media. For the past four years, the truck has supported all in-house A/V production for the Atlanta Hawks at Phillips Arena (renamed State Farm Arena in 2018), and, when the venue’s A/V system was overhauled prior to the 2018-19 NBA season, TNDV opted to do the same for Blackjack and put it back on the road under the new Destination moniker. Destination conforms with TNDV’s “-ation” suffix concept, joining Exclamation, Aspiration, Inspiration, and Vibration. With Destination, TNDV is targeting primarily the concert/festival market, although, according to Dugger, there will be plenty of room for sports as well. 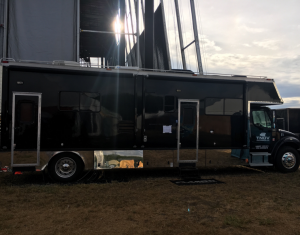 “We are seeing a lot of interest in this truck for large concerts, festivals, and entertainment events,” he says. “We have specialized the infrastructure to handle a high density of video and audio feeds. We can switch multiple outputs from within the truck, which is a nice feature for these large musical events. The 40-ft. expando is built around a Ross Carbonite 3M/E switcher and Imagine Communications Platinum router. Wired for six camera chains, it rolls with four Hitachi HD-SK1200 cameras outfitted with Fujinon lenses. Audio is handled by a Soundcraft Si Expression 1 console (16 faders/64 input channels) and A-T, Telefunken, and Studio Tech microphones; comms, via an RTS 24-port Matrix intercom system. A NewTek 3Play is on board for replay (with EVS and Ross Video Abekas Mira systems available on request). In addition, the truck is wired for five DDR/VTR record decks and features AJA Ki-Pro digital disc recorders. Graphics are available on request (ChyronHego HyperX3, Ross XPression, or Avid Deko). An unusual layout features two main production areas and an audio suite. The back area of the truck is very separate from the front area, providing a sizable space for producers or editors to work during a live production. TNDV has added a full “picnic-style” bench, as well as a small kitchenette with a refrigerator and table seating for the crew to use. Beyond multi-stage festivals and large entertainment events, Dugger sees opportunity for Destination to serve high school and college sports. He also considers the unit an ideal companion truck for larger award shows and sports events requiring one of TNDV’s flagship trucks: for example, red-carpet shows or interview desks at a sports event. With a total of nine trucks, TNDV continues to grow its fleet and serve the niche market of customers requiring high-end production facilities with a smaller footprint than 53-footers can offer.